As eye diseases, like macular degeneration and glaucoma, impact a growing number of aging baby boomers, researchers around the world are looking for answers � what causes these diseases, how can they be treated or prevented? Now, an innovative research team in London, Ont. is taking a new approach and looking at those old questions in a brand new way. The team brings together three very different disciplines � medical research, biology and engineering � in an approach to the research that the members believe to be a first in Canada. �We�re all interested in the same questions but what we each bring to the table is a much different perspective and I think that�s what takes this into the innovative realm,� says Dr. Cindy Hutnik, an ophthalmologist, medical researcher and associate professor at the University of Western Ontario, who has hooked up with biologist Kathleen Hill and engineering professor Tim Newson. In fact, says Newson, who started his career as a civil engineer but got drawn into research a decade ago as the result of chat with an ophthalmologist during a rugby game in his native Scotland, the eye behaves as a structure. �It�s a pressure vessel, a pressurized sphere.� The cornea, he says, is like the dome of a building. And, the mathematical principles used in engineering apply equally to the structure of the eye. In her lab, Hutnik studies the cells of the eye but notes that at the base of all cells are the genes, the DNA, which is Hill�s particular area of interest. The research is already well underway and �the information is starting to role off the press,� says Hutnik, who will be presenting some of the first results at national and international meetings this spring. One of the areas the team has focused on is drug delivery, using some cutting-edge equipment such as a novel synthetic eye model and a mini-CT scanner, one of only four in the world. This is an exciting project, she says, because it can apply to all eye diseases. In another experiment, mice have been genetically programmed to develop diseases similar to AMD and glaucoma and drugs are being tested to see if the degeneration can be prevented. Hutnik hopes to establish this Experimental Eye Research Facility as a centre of excellence which will eventually pull in researchers from still other disciplines to add their expertise. She has already had interest expressed by members of other disciplines as well as industry in getting involved. The facility is also a training centre for students interested in vision research and has one masters of science student and a couple of undergraduates already working on the projects. As eye diseases, like macular degeneration and glaucoma, impact a growing number of baby boomers, researchers around the world are looking for answers � what causes these diseases, how can they be treated or prevented? An innovative research team in London, Ont. has been looking at those old questions in a brand new way � a multi-disciplinary approach. Experts from various areas of medicine, and even from non-medical disciplines, are bringing their diverse perspectives to the table to see if they can come up with new answers, an approach believed to be a first in Canada. And, they�re succeeding, says team leader and founder Dr. Cindy Hutnik, an ophthalmologist, medical researcher and associate professor at the University of Western Ontario. The team started with three very different disciplines � medical research, biology and engineering � personified by Hutnik, biologist Kathleen Hill and engineering professor Tim Newson. Earlier this year, a major grant from the Plunkett Foundation, a London charitable organization, allowed the team to move ahead with new equipment � such as a novel synthetic eye model and a mini-CT scanner, one of only four in the world � as well as a base of operations at the Lawson Health Research Institute. With the help of other experts and some enthusiastic students, researchers at the fledgling Experimental Eye Research Facility have made progress and have already found a couple of those answers. In one area, the research has identified one of the factors that leads to the �wet� � and most devastating � form of macular degeneration, taking the patient quickly from sight to blindness. Another area of investigation has been glaucoma treatments. Patients have often found the eye drops necessary to treat the condition irritating. Hutnik�s team was able to place the blame on toxic preservatives in the drops. Thanks to collaborator Dr. Gordon Laurie, a Canadian physician currently practicing at the University of Virginia, they have isolated a new peptide molecule called Lacratin that protects the eye against these preservatives. There has already been interest from industry in incorporating the protective peptide into the eye drops. She�s also excited about research being done with a mouse (�we call it the �Harlequin� mouse because it looks like a little Harlequin cat�), that�s genetically programmed to undergo retinal degeneration, much like the process of macular degeneration and glaucoma. Using equipment purchased with the Plunkett grant, researchers are able to monitor the mouse�s retina to see if different drugs might reverse the degeneration. One of the noteworthy aspects of this research, Hutnik says, is a project looking at genetic predisposition, conducted by a fourth year pathology student who is heading for medical school. For most, she says, the work is a stepping stone to their career goals � be it medical school, a higher degree, or a job in the pharmaceutical industry � and often done voluntarily. However she endeavours to get some funding for those who work under her. Nevertheless, the big benefit for them is the opportunity to head up a project and present the findings, nationally or internationally, and be published. For the researchers, it�s new ideas and enthusiasm. �Some of the most successful research has been done by students who are very early in their training,� Hutnik says. 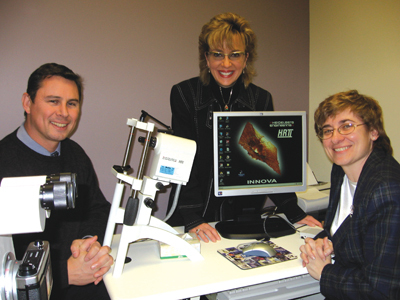 She cites the example of Evan Martow, a young man almost fresh out of high school, who expressed interest in the eye and in medical school and has gone on to do some great research on the laser used to treat glaucoma. For students looking to get involved in medical research and interested in vision and London�s innovative multi-disciplinary approach, Dr. Cindy Hutnik is the go-to girl.